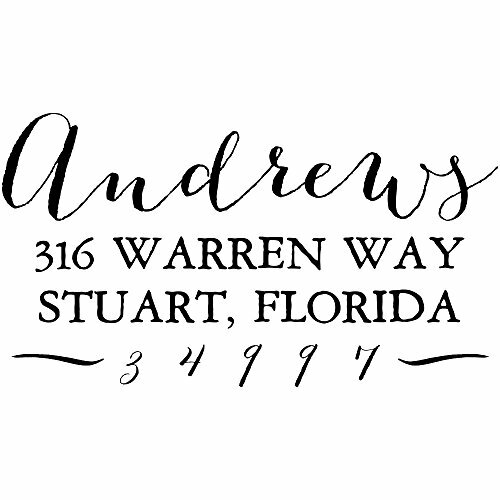 Ink Pen Address Stamp | Return Address Stamps | Pretty Stamps | Script Font Address Stamps | Custom Stamps by 904 Custom at Community Frontiers. MPN: lw_303. Hurry! Limited time offer. Offer valid only while supplies last. HOW TO ORDER: To customize, please click on the 'Customize Now' button on the right. There you can enter your custom text and choose your font color! Self-Inking stamps utilize a mechanism that contains a spring, your personalized rubber stamp dye and the ink pad. When it is not being used, the dye rests inside the ink pad and once the machine is pressed down, the spring pushes the inked rubber dye onto the surface you're stamping! This makes self-inking stamps perfect for rapid stamping, so you will be able to knock out the large pile of envelopes in minutes! The ink pad is preinstalled; so once it is received, you're ready to stamp! When you're done stamping there is no disassembly required, you can simply put it away until the next stamping! This personalized stamp creates an impression size of of approximately 1" x 2.5", which is ideal for any size envelope. There are eight ink colors to choose from, black, red, blue, green, pink, purple, orange and brown! View More In Stamps & Stamp Supplies. If you have any questions about this product by 904 Custom, contact us by completing and submitting the form below. If you are looking for a specif part number, please include it with your message.